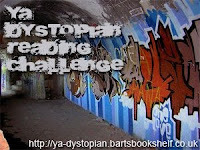 This last year I took part in the YA Dystopian Reading Challenge put on by Bart’s Bookshelf. It went from October to December, and the object was to read four books that answered the description in the challenge title (young adult + dystopian. also, reading.). As it’s now January, I thought I’d do a ‘wrap-up’ post and tie all those ends up neatly. True confession: I actually only read three books. *gasp* You can click on the links below to go to my reviews. Never fear! There will be plenty of continuing YA & dystopian content here in the coming months. Sometimes even in the same stories! The dystopian/post-apocalyptic titles I plan to get to in 2010 include: Restoring Harmony, The Road, Genesis, How I Live Now, Life As We Knew It, The Ask and the Answer, Monsters of Men, The Dead-Tossed Waves, The Island at the End of the World, the last Hunger Games novel, Inside Out and Tomorrow, When the War Began. I’ll probably add one or two more, and save a couple for another time. But 2010 should be dystopia-wonderful! A great YA/dystopian book you might want to look into is The House of the Scorpion by Nancy Farmer. I gobbled it up! well done dude! I think I might go trawling for a good dystopian challenge this year - the deadtossed waves- i CANNOT WAIT! Several of your dystopian TBR are on my to-do list as well (finally requested "The Ask and the Answer" from the library), but I haven't heard of others. Looking forward to your reviews! I haven't heard of some of your TBR books, but I'm looking forward to seeing what you think! I love YA dystopian books & definitely want to read some more of them this year. All fantastic choices. We're going to have a fantastic dystopic year! Great picks. I loved Hunger Games. Good luck!